Being a major meta-dude, Barth opens this collection of essays with a mini-piece on book titles, followed by one on book sub-titles, which is in turn followed by a short bit on introductions, by way of introduction. A surprising bit of trivia ends this introduction: he notes that collections such as this usually contain collected book reviews, but this one does not, because, he writes,...my vows to the muse, made long ago and reasonably well kept, prohibit among other things the giving or soliciting of advertising testimonials and the reviewing of books...Highly unusual. But Barth is like that. Unusual, but no iconoclast, bomb-thrower, or enfant terrible. He is unconventional but quite institutional, specifically re higher ed, where he has worked his whole adult life and where he has set much of his fiction. The first "proper" essay, written for one of those dorky assignments of the "Why I Write" variety by which periodicals hope to publish quick telling snapshots that reveal a writer to us, Barth sets about subverting with an intriguing reflection on language and being a twin. This reminded me of the strange case of Poto and Cabengo, two twin girls who, left alone for most of their early years, created their own private language, organically and independently, speaking it until the age of eight. Barth states that for twins language itself is almost already a second language to the primary communication with one's other half, for whom so much goes without saying: "Language is for getting to know you and getting to unknow you. We converse to convert, each the other, from an Other into an extension of ourself; and we converse conversely. "Barth's discovery of literature was late and nonchronological, and it makes me wonder what it's like to delve into Faulkner before Austen, Joyce before Dickens, Kafka before Dostoyevsky. It's difficult for me to imagine mentally constructing a World of Literature without a skyline dominated by the 19th century novel, especially given how modernism and post-modernism are so often contextualized as rebellious or revolutionary, counter to that dominant form. How do those rebels look, I wonder, in a light unshadowed like that?It might be presumptuous to suggest that perhaps this is why Barth's attitude isn't contemptuous of convention--or of almost anything for that matter--but rather is generous and promiscuous, absent the pugilistic pose struck by so many experimentalists. "For apprentices, all work is experimental, as in another sense it is even for seasoned professionals. In my own literary temperament, the mix of romantic and neoclassical is so mutable that I hold no particular brief either for or against programmatic experimentalism. Passion and virtuosity are what matter; where they are, they will shine through any aesthetics." (114)Also unlike many other writers with whom he is grouped, he does not bristle at the label "postmodernist." He takes it seriously and attempts a definition, after a few light objections to the way others have, especially as an unsubtle dismissal: "John Gardner goes even farther in his tract On Moral Fiction (1978), an exercise in literary kneecapping that lumps modernists and postmodernists together without distinction and consigns us all to Hell with the indiscriminate fervor characteristic of late converts to the right." [oooo burn--Gardner is the only writer to suffer such digs in this book] Barth describes it as a "literature of replenishment" in an essay so entitled, correcting the previous "literature of exhaustion." He does not assert that it is new, though, and elsewhere quotes from a translated Egyptian Epic's intro:"Would I had phrases that are not known, utterances that are strange, in new language that has not been used, free from repetition, not an utterance which men of old have spoken"That's dated around 2000 BCE.The two main motifs of this book are sailing and Scheherazade, two topics the return to which does not always seem voluntary on Barth's part. At the edges of these essays are the rocky shoals and shallows of the Chesapeake Bay area, scene and setting for the birth not only of storyteller and teacher Barth; he is also a mariner. Scheherazade's model of the frame-tale narrative structure as a way of seeing the mind's way of making sense of a busy day is demonstrated by Barth in a description of the practical necessities of sailing, tasks within tasks within tasks, beginning with a ship's underside needing a new coat: beginning at the bottom, upturned. Given how often sailing and Scheherazade came up I had started to wonder how he would bring the two together; it wasn't nearly as forced as I'd anticipated and came up unexpectedly in an address to a sci-fi conference in Boca Raton.The book ends with the most curiously obsessive piece in the collection, one in which intricate gestational and menstrual mathematics account for the magical number of 1001 Nights. Rather than summarizing such, I think I'll just leave it at that. This is where it all started, almost. Where it started was Further Fridays but only because it fell into my lap first. With Barth the plethora and the cornucopia of postmodern fiction opened like a cliche’d flower opening. Gass and Gaddis just for beginners. So but this time around, the second through The Friday Book for me, was due to an itch ... and a lack of an index to this collection of essays and etc’s. I wanted to locate the location where I first ran across the name Christine Brooke-Rose ; and thumbing through this book for that purpose I saw names and names and names and many a title roll off the page back into my lap and I could not resist revisiting its pages one at a time. Report :: Amalgamemnon is not in here. But lots of other stuff is.Before we get to the main event, here are a few essays required reading even for the non-Barthian ::“The Literature of Exhaustion”“The Ocean of Story”“The Future of Literature and the Literature of the Future”“Blue Crabs, or, About Aboutness”“The Literature of Replenishment”“The Self in Fiction, or, ‘That ain’t no matter. That Is Nothing.’”“Tales Within Tales Within Tales”“The Prose and Poetry of It All, or, Dippy Verses”To the Lists.....from “The Title of This Book”The Canterbury TalesThe TrialThe IdiotMoby-DickThe Anatomy of MelancholyThe Friday BookThe FrogsThe BirdsDon QuixoteTom JonesCatch-22The Adventures of Huckleberry FinnSteal This BookThe Sun Also RisesThe Winter of Our DiscontentTender Is the NightHow Green Was My ValleyWinter BloodNot as a StrangerThe Executioner’s SongWar and PeacePride and PrejudiceSense and SensibilityThe Beautiful and DamnedThe Naked and the DeadThe Agony and the EcstasyBy Love PossessedToo Late the PhalaropeAfter Many a Summer Dies the SwanThe BibleFilmPlayThe Greatest Story Ever ToldThe Great American NovelDecameronHeptameronPentameronThe Ocean of StoryPanchatantraVetalapanchavimsataBook of the DeadGuinness Book of World RecordsKitab Alf Laylah Wah LaylahBook of the Thousand Nights and a NightThe Marvels and Wonders of the Thousand Nights and a NightThe Stories of the Thousand Nights and a NightThe Book of the Book of the Book of the Thousand Nights and a NightThe Title of This BookBook-Titles Should Be StraightforwardIliadfrom “How to Make a Universe”Thomas MannRichard WagnerRobert FrostFrançois RabelaisMarcel ProustHonoré de BalzacLewis CarrollEzra PoundWallace StevensSt PaulSophoclesSocratesShakespearePlatoLeslie FiedlerFranz KafkaOrtega y GassetLucretiusDostoevskyRobert Louis StevensonStendhalHenry FieldingJane AustenCharles DickensGustave FlaubertJames JoyceAristotleLeibnitzKenneth BurkeTrollopeConradDon QuixoteSancho PanzaOedipusGoetheHamletTurgenevSchopenhauerPaul ValérySartreLeonardo da VinciKierkegaardFaulknerJohn DeweyHoraceHuckleberry FinnAlan WattsSuzukifrom “The Ocean of Story”“The road to India is a long road, but it is the only way to India.”The Thousand and One NightsKatha Sarit Sagara, or, The Ocean of Streams of StoryLa Vida Es SueñoThe PanchatantraPent- Hept- and DecameronsLusiadEugene OneginJerusalem DeliveredVetalapanchavimsatiSiddhi-KurThe Seven SagesKalilah and DimnahSyntipas the PhilosopherThe Fables of BidpaiSindibad’s ParablesDolopathosDirectorium Vitae HumanaeDiscorsi degli AnimaliDoni’s NovelleWestward for SmeltsTroilus and CriseydeKathapithaBrihat KathaOdysseyKatantraLa BohèmeIliadSamavidhana Brahmanafrom “The Literature of Replenishment: Postmodernist Fiction”William GassJohn Hawkesmyself[the trick for the following, whether they pre- post- or modernist be]Donald BarthelmeRobert CooverStanley ElkinThomas PynchonKurt Vonnegut, Jr.Saul BellowNorman MailerSamuel BeckettJorge Luis BorgesVladimir NabokovRaymond QueneauNathalie SarrauteMichel ButorAlain Robbe-GrilletRobert PingetClaude SimonClaude MauriacJohn FowlesJulio CortázarMichelangelo AntonioniFederico FelliniJean-Luc GodardAlain ResnaisGabriel Garcia Márquez [exemplary]Italo Calvino [exemplary]T. S. EliotWilliam FaulknerAndré GideJames JoyceFranz KafkaThomas MannRobert MusilEzra PoundMarcel ProustGertrude SteinMiguel de UnamunoVirginia WoolfAlfred JarryGustave FlaubertCharles BaudelaireStéphane MallaméE. T. A. HoffmannLaurence SterneMiguel de CervantesJohn CheeverWallace StegnerWilliam StyronJohn UpdikeJoyce Carol OatesJohn GardnerJonathan SwiftAlexander PopeVerdiTennysonTolstoyStravinskyEliotJoyceDickensTwainHugoDostoevskyTolstoyHomerAeschylusBertolt BrechtEvgeny ZamyatinJames MichenerIrving WallaceGore Vidal“Would I had phrases that are not known, utterances that are strange, in new language that has not been used, free from repetition, not an utterance that has grown stale, which men of old have spoken.” -- Khakheperresenb, Egypt 2000BC.from “The Self in Fiction, or, ‘That ain’t no matter. That Is nothing.’”Mark TwainHuck FinnKurt VonnegutPhilip RothJohn UpdikeBernard MalamudBorges’s BorgesNabokov’s Van Veenthe restJoyce’s DedalusMann’s Kröger and AschenbachProust’s MarcelKafka’s Samsa [and our Gregsamsa]FlaubertHenry JamesRoland BarthesMister Charles DickensGoethe/WertherFielding’s Tom JonesSmollett’s Roderick RandomLaurence Sterne’s Tristram ShandyDon QuixoteAlcofribas Nasier’s Gargantua and pantagruelDante/DanteHomer/DemodocusThe “I” of the scribe KhakheperresenbMadame Bovery, c’est moi.Monsieur Flaubert, c’est moi.In other word’s, DFW’s convolutions about self-consciousness came waaay late.from “Tales Within Tales Within Tales”in place of a list :: “Derjenige, der den Mann, der den Pfahl, der auf der Brücke, der auf dem Weg, der nach Worms führt, liegt, steht, umgeworfen hat, anzeigt, bekommt eine Belohnung.” -- Todorovfrom “The Prose and Poetry of It All, or, Dippy Verses”first, in recognition of Friend Jeff Bursey reminding me whence comes the definition of The Novel, Randall Jarrell’s quip ;; “a prose narrative fiction of a certain length that has something wrong with it.” Here is what is wrong with that definition ::Flaubert’s Madame BovaryCapote’s and Mailer’s ‘nonfiction novels’Alex Haley’s whatyoucallit novel RootsDino Buzzati’s comic-strip novel of the late 1960’sMarc Saporta’s unbound, unpaginated, randomly package novel-in-a-boxNikos Kazantzakis’s long verse-novel, The Odyssey: a modern sequelThe latest pornographic photonovel from Hamburg, Paris, or RomeMarcel Proust’s zillion-word roman fleuveRobert Coover’s very short new novel Spanking the MaidAnd this is a good place to add the following footnote, from Further Fridays :: [re :: Burton’s Anatomy of Melancholy] Not a novel? Sure it is, in this metabolic mode: a novel in which characteristics take the place of characters. Instead of Musil’s Man Without Qualities, Burton gives us the adventures of a Quality without particular embodiment. But the thing must be read properly, including every one of the Author’s Notes -- many per page, all in Latin, an effect the more piquant if, like me, you have but small Latin -- plus the appended glossary and the whole Nabokovian index, from ABBEYS, subversion of the, to YOUTH, impossible not to love in. Friedrich von Schlegel’s generous conception of der Roman (see the Friday-pieces on Postmodernism, Chaos Theory, and the Romantic Arabesque, farther on in this volume) would readily accommodate Burton’s Anatomy.On with the Fridays..... And long live that dead and long=dying thing : THE NOVEL! And its godparent, FICTION!! Defining PostmodernismJohn Barth was there the whole time Postmodernism was happening. However, I’m not sure whether he's the best person to attempt a definition of the term.Sometimes, the best people to document history are not those who participated in the events, but those who came afterwards, and can look at the events from different and multiple perspectives.Frankly, I expected more of Barth, one of my favourite authors. He is/was both a story-teller and a teacher of story-telling.However, I wonder now whether it was unfair to expect more of him (i.e., more than expecting him to tell his own stories). Barth is the first to admit that his talent is for the writing rather than the critical analysis of his own or others' work:"Writing well, reading or discussing well, are separate talents... There is simply no correlation either way between the two (or among the three) competencies. "The Postmodernist ProgramUltimately, Barth's real skill is to define precisely what he was trying to do (perpetuating the traditions of story-telling, frame-stories and his adoration of Scheherazade) and, in the absence of an adequate definition of Postmodernism, to describe what he felt other writers should be trying to do.Thus, he doesn’t really come up with a definition, but a program:“In my view, the proper program for postmodernism is neither a mere extension of the modernist program..., nor a mere intensification of certain aspects of modernism, nor on the contrary a wholesale subversion or repudiation of either modernism or what I'm calling premodernism: 'traditional' bourgeois realism.“My ideal postmodernist author neither merely repudiates nor merely imitates either his twentieth-century modernist parents or his nineteenth-century premodernist grandparents...Barth is really striving for the personal freedom of the author:"...we may regard ourselves as being not irrevocably cut off from the nineteenth century and its predecessors by the accomplishment of our artistic parents and grandparents in the twentieth, but rather as free to come to new terms with both realism and antirealism, linearity and non-linearity, continuity and discontinuity. If the term "postmodern" describes anything worthwhile, it describes this freedom, successfully exercised. "To this I'd add the view that artistic movements become sterile when they become prescriptive and programmatic.Passionate VirtuosityBarth also emphasises certain basic skills. His is not solely an ideological agenda:“I was on the whole more impressed by the jugglers and acrobats at Baltimore's old Hippodrome, where I used to go every time they changed shows: not artists, perhaps, but genuine virtuosi, doing things that anyone can dream up and discuss but almost no one can do...“...in other words, [an artist] endowed with uncommon talent, who has moreover developed and disciplined that endowment into virtuosity...So, what is this virtuosity applied to?“The subject of literature, says Aristotle, is 'human life, its happiness and its misery.' I agree with Aristotle. That's why we object to the word experimental. It suggests cold exercises in technique, and technique in art, we all know, has the same importance as technique in love: Heartless skill has its appeal; so does heartfelt ineptitude; but what we want is passionate virtuosity.”Algebra and FireBarth drew enormous inspiration from Jorge Luis Borges and his distinction between algebra and fire:"Let Algebra stand for technique, or the technical and formal aspects of a work of literature; let Fire stand for the writer's passions, the things he or she is trying to get eloquently said. The simple burden of my sermon is that good literature, for example, involves and requires both the algebra and the fire; in short, passionate virtuosity. If we talk mainly about the algebra, that is because algebra lends itself to discussion. The fire has to speak for itself. "Technique is not all, nor is a rejection of all previous techniques. The author can pick and choose the strings for their bow:"At heart I'm an arranger still, whose chiefest literary pleasure is to take a received melody - an old narrative poem, a classical myth, a shopworn literary convention, a shard of my experience, a New York Times Book Review series - and, improvising like a jazzman within its constraints, reorchestrate it to present purpose. "Besides, what Barth objected to most was the prosaic, especially if it was "dull and tedious writing" (a criticism I'd level at many humourless mega-novels). He was trying to entertain his readers. He was determined to enjoy himself in his works as well:"They're meant to be serious enough to be taken seriously, but they're not long-faced. They're pessimistic, but I hope they're entertaining. In all of them, for better or worse, the process of narration becomes the content of the narrative, to some degree and in various ways; or the form or medium has metaphorical value and dramatical relevance. The medium really is part of the message. "The Death of the NovelBarth was writing at a time when authors and critics were prophesying the death of the novel.However, once he had discovered the fiction of Borges, he was much more optimistic about its future. The perceived problems actually illuminated the solutions or the way out. He wanted to explore whether:"different kinds of artistical felt ultimacies and cul-de-sacs can be employed against themselves to do valid new work: whether disabling contradictions, for example, can be escalated or exacerbated into enabling paradoxes. "Ultimately, to the extent that we were ever concerned that the novel might be dead, it’s partly because of Barth’s own passionate virtuosity that it is still alive, even if it owes considerably less to his literary criticism.Barth, Fiedler and GassTwo people inhabit this collection of essays, like ghosts or phantasms: Leslie Fiedler and William H. Gass. *In retrospect, I probably first learned of Barth’s fiction in 1981, when I read a number of Fiedler’s collections of essays that had been published a decade earlier.Barth describes him as “my friend and colleague the erudite, unpredictable, iconoclastic, large-spirited troublemaker Leslie Fiedler, from whose outrageous statements I have seldom failed to learn.”I was familiar with Fiedler’s writing from his contributions to “Partisan Review”. However, he was more of a radical nonconformist than the usual contributors to that magazine. The nearest analogy I can think of, but in a musical context, is that he was literature’s Lester Bangs, only a better thinker and writer.Fiedler wrote a very positive review of Barth’s “The Sot-weed Factor” (“John Barth: An Eccentric Genius”) that was published in January, 1961.However, Fiedler was also one of the first literary critics I can recall using the word “Postmodernism” - in his 1970 essay, “Cross the Border – Close the Gap”:“We are living, have been living for two decades - and have become acutely conscious of the fact since 1955 - through the death throes of Modernism and the birth pangs of Post-Modernism. The kind of literature which had arrogated to itself the name Modern (with the presumption that it represented the ultimate advance in sensibility and form, that beyond it newness was not possible), and whose moment of triumph lasted from a point just before World War I until one just after World War II is dead, i.e., belongs to history not actuality. In the field of the novel, this means that the age of Proust, Mann, and Joyce is over; just as in verse that of T.S. Eliot, Paul Valéry, Montale and Seferis is done with.”Barth is equally complimentary of “my friend William H. Gass - a professional philosopher as well as a professional storyteller,” notwithstanding that the only fiction Gass had written during the timeframe of this collection (1960 to 1984) and then up to 1995 was one novel, one book of short stories and a novella. Still, they seemed to share at least some intellectual affinity about what the novel should be doing, if not necessarily the role of story-telling, character or plot. No doubt the relationship was cemented when the two of them (with John Hawkes and their wives) did a lecture tour to the University of Tubingen in 1979. Barth and Gass Bag their PeersFiedler was a great promoter of the avant garde, the experimentalist and the non-conformist. However, he was also an astute critic of the novelists who preceded the generation of writers he was promoting.Thus, his criticism is equally worth reading, whether he was writing about John Barth, John Hawkes, Saul Bellow, Philip Roth, Norman Mailer or John Updike.Barth and Gass, on the other hand, despite Barth's own openness to traditional or pre-Modernist techniques, were participants in a battle for the attention of publishers and readers (not to mention comfortably tenured academic positions). No matter what the author embraces or imitates from the past, at times it still seems necessary that they must repudiate the most recent movement before them.One thing that spoils this collection is the snarkiness of comments about peers like Mailer (whose stylistic innovation Barth is reluctant to acknowledge, while he makes silly subjective comments about the titles of his novels), Updike, Bellow (“programmatically traditional writers like Styron, Updike, and Bellow”), even Roland Barthes (“French hyperbole”).On the other hand, Barth is ever alert to promote the like-minded when they agree with him, such as Gass and John Hawkes. Perhaps, though, we need to recognise that, in the generational wars between writers (or among writer-academics), our mythic heroes are human after all. As Barth says of Scheherazade, you're only as good as your next story; night by night, it's publish or perish. In the case of academia and public opinion, at least, you're threatened both by those who came before you and those who would come after you. Quite apart from this reservation, readers will probably learn more about Postmodernism by reading Barth's fiction in all its liberated glory than his more prescriptive and programmatic non-fiction. In the end, to paraphrase Barth, fiction is something that most authors do better than discuss.POST(MODERN)SCRIPT:The Capriciousness and Ephemerality of Distinctions* After writing my original review, I remembered another one of the connections between Barth, Fiedler and Gass:Harold Augenbraum [currently Executive Director of the National Book Foundation] writes:"I would love to have been a fly on the wall of the 1973 [National Book Award] Fiction panel discussions. "The judges seem to have fallen into two camps: what you might call “post-modern” (Fiedler, Gass), and traditional (Connell, Percy, Yardley). "And so they split the award between John Barth’s Chimera and John Williams’ Augustus, two novels as different in style as they could be, despite the link between the former imagining the inner lives of mythical characters and the latter the inner lives of historical people from the ancient world." Drole. Luxuriant. Self-indulgent. 4 or 5 substantial essays padded with 1-, 2- and 3-page transcripts of speeches, often repetitive, often regarding topics which Barth admits hold little interest for him, and which he justifies (in 1-, 2- and 3-page even more drole, luxuriant, self-indulgent introductions) on the grounds of his taste for travel to and from the events at which he delivers said speeches, especially when it’s paid for by arts councils and universities. There’s a few insights here, no doubt, and sure, Barth’s good-natured; it’s hard not to like him. But much of this is straight-up self-promotion, spoken in a tone that discourages me from delving further into his several-thousand page ouvre. He says it himself early on: he became a lecturer so he could write “left-handed” in between shifts at the university. This here, for the most part―necessarily, since for the most part its shape is dictated by his audiences and his patrons (ie: a discussion on the new American novel here, one on the self in postmodernism there)―is strictly left-handed. Clever (in the manner of witty before-dinner conversation) it may be; pertinent, revolutionary or mind-expanding (to this reviewer) it is not. A relic. Strictly for the fans. An old book ,really, but some of the essays in this book are the best simple explanations of Postmodern literature that i've ever read. Barth was laying out his case for the Postmodern in terms a layman could understnd. Fun Friday Book drinking game: Every time Barth bangs on about Scheherazade, take a sip of the beverage of your choice that is off-limits to pregnant women and those operating heavy machinery. Oops—now you're dead! No more books for you. The essays are interesting and at times insightful, but he makes writing seem like a herculean task. Therefore, if your interested in writing (and encouraging words from a great writer) this book will be kind of depressing. Barth's first collection of his non-fiction essays. He has much to say of the literary trends of that day. The essays that I'm interested in are really good, but there are several that don't interest me whatsoever. Worth the read, though. John Barth - John Simmons Barth is an American novelist and short-story writer, known for the postmodernist and metafictive quality of his work.John Barth was born in Cambridge, Maryland, and briefly studied "Elementary Theory and Advanced Orchestration" at Juilliard before attending Johns Hopkins University, receiving a B.A. in 1951 and an M.A. in 1952 (for which he wrote a thesis novel, The Shirt of Nessus).He was a professor at Penn State University (1953-1965), SUNY Buffalo (1965-1973), Boston University (visiting professor, 1972-1973), and Johns Hopkins University (1973-1995) before he retired in 1995.Barth began his career with The Floating Opera and The End of the Road, two short novels that deal wittily with controversial topics, suicide and abortion respectively. They are straightforward tales; as Barth later remarked, they "didn't know they were novels. "The Sot-Weed Factor, Barth's next novel, is an 800-page mock epic of the colonization of Maryland based on the life of an actual poet, Ebenezer Cooke, who wrote a poem of the same title. The Sot-Weed Factor is what Northrop Frye called an anatomy — a large, loosely structured work, with digressions, distractions, stories within stories, and lists (such as a lengthy exchange of insulting terms by two prostitutes). The fictional Ebenezer Cooke (repeatedly described as "poet and virgin") is a Candide-like innocent who sets out to write a heroic epic, becomes disillusioned and ends up writing a biting satire.Barth's next novel, Giles Goat-Boy, of comparable size, is a speculative fiction based on the conceit of the university as universe. A half-man, half-goat discovers his humanity and becomes a savior in a story presented as a computer tape given to Barth, who denies that it is his work. In the course of the novel Giles carries out all the tasks prescribed by Joseph Campbell in The Hero with a Thousand Faces. Barth kept a list of the tasks taped to his wall while he was writing the book.The short story collection Lost in the Funhouse and the novella collection Chimera are even more metafictional than their two predecessors, foregrounding the writing process and presenting achievements such as seven nested quotations. In LETTERS Barth and the characters of his first six books interact.While writing these books, Barth was also pondering and discussing the theoretical problems of fiction writing, most notably in an essay, "The Literature of Exhaustion" (first printed in the Atlantic, 1967), that was widely considered to be a statement of "the death of the novel" (compare with Roland Barthes's "The Death of the Author"). Barth has since insisted that he was merely making clear that a particular stage in history was passing, and pointing to possible directions from there. 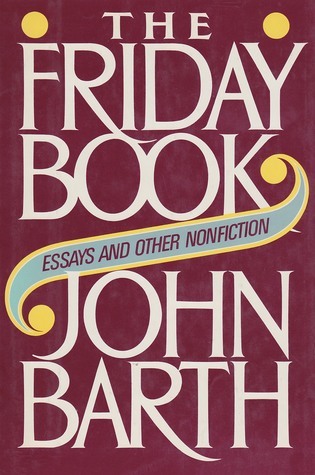 He later (1979) wrote a follow-up essay, "The Literature of Replenishment," to clarify the point.Barth's fiction continues to maintain a precarious balance between postmodern self-consciousness and wordplay on the one hand, and the sympathetic characterisation and "page-turning" plotting commonly associated with more traditional genres and subgenres of classic and contemporary storytelling.